- Silicone is completely BPA-free, Silicone leaf handle is a beautiful aesthetic addition that protects fingers as this never heats up making it extra safe. - Steel ball's holes design reduces floats and tea debris in your mug and easy to clean. - Each tea infuser comes with a separate silicone drip tray to rest your tea infuser ensuring everything is kept safe, healthy and clean. - Perfect for medium and large mugs and cups. We are so confident in the quality of our product that we offer a 180-day satisfaction guarantee! If you are unsatisfied, simply contact us to return the product for a full refund. ★ FINE FILTER HOLE -- Tea filter hole is only 0.3 mm, allows water to move through but keeps most of them in the steel tea ball. Loose Tea Steeper suits for medium to large leaf loose teas, not for ground tea or very fine tea leaves. ★ EASY TO USE -- Simply fill the stainless steel Tea Infuser with tea, twist to close, steep with hot water and then get a cup of fresh full flavored tea. Perfect for working or travelling. 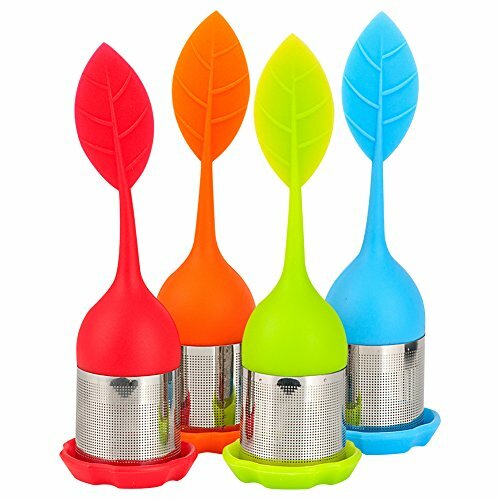 ★ MUTIFUNCTIONAL -- Loose Leaf Tea Strainer can be used to filter tea-leaves, coffee beans raw materials, scented tea debris and floats. Tea Interval Diffuser provides convenience and ideal for home, office, traveling. Share this with your family. If you have any questions about this product by Teroys, contact us by completing and submitting the form below. If you are looking for a specif part number, please include it with your message.